Did you know that 1 out of 2 women are diagnosed with osteoporosis? Are you aware that a women’s risk of breaking a hip is equal to her combined risk of breast, uterine and ovarian cancer? According to the International Foundation of Osteoporosis, 1 in 3 women over the age of 50 will develop a fracture due to osteoporosis. Osteoporosis is a serious “silent” condition where your bones become weak and prone to fracture. You may learn you have osteoporosis only after breaking a bone. Fractures of the bones, a loss in height or a forward curvature of your upper spine are all signs that your bones are weak. The main goal of treating osteoporosis is to prevent such conditions in the first place. We, at Orange Coast Women’s Medical Group believe in this prevention of care and take great strides in diagnosing osteoporosis before any issues have a chance to arise. Osteoporosis can keep you from doing the things that you enjoy and can lead to feelings of isolation or depression and other health problems. According to the National Osteoporosis Foundation, twenty percent of seniors who break a hip have complications that led to death from the fracture itself or from the surgery to fix the fracture within the first year of the occurrence. One important fact regarding bone density is that the amount of bone gained during adolescence should equal the amount lost during the rest of your life. 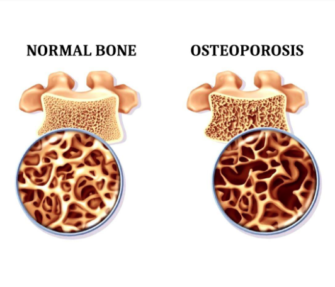 So, the greater your bone mass is when you reach menopause, the lower your chances are of developing osteoporosis. This is especially important for postmenopausal women. A woman can lose up to 30% of her calcium, leading to bone loss and ultimately to osteoporosis. Many factors can raise your risk of developing osteoporosis which can lead to pathological fractures. Education regarding certain medications and diseases that can affect bone loss or help in gaining bone strength. 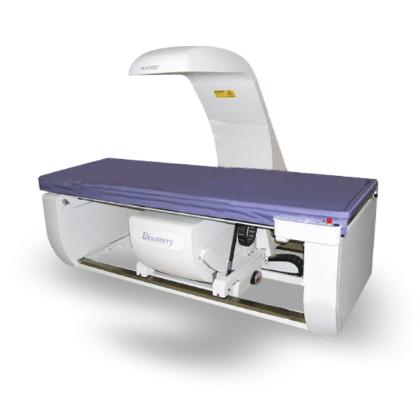 Obtain a Bone Density Test, conveniently located within our Laguna Hills office. A Bone Density test, or DEXA (Dual Energy X-ray Absorption) is a very simple, painless and quick test that measures the amount of current bone mass in certain regions of your body. It uses a very small amount of radiation and small amount of thermal energy that combine to give a computer image. This image is based on the attenuation or absorption of this combined energy to bone. The regions scanned, usually the lumbar spine and left hip will be analyzed and as needed will be compared to any prior bone density test. The software analysis will then give a total score as well as a graphical measurement of how much, if any, bone loss you have acquired. DEXA is the most current and precise test that will assist your OCWMG physician to ascertain several things regarding your bone health. It supports preventative health by giving your Physician information to generate critical diagnostic information accurately, to assess your pathologic fracture risk, to analyze your body composition and evaluate treatment options thereby creating an informed team approach for the health of your bones. Today we know more about how to prevent, detect and treat bone loss. You are never too young or too old to take care of your bones. Effective communication, early prevention and good lifestyle habits can help you decrease your chance of ever having osteoporosis. After your DEXA, feel free to follow our links below for more information regarding our services and osteoporosis prevention. Day of Wellness Program: Offers multiple exams, including bone density and nutritional consult, all in one day.